Every solar owner needs to read this guide before selling their home. It can be confusing when it’s time to sell your solar home. 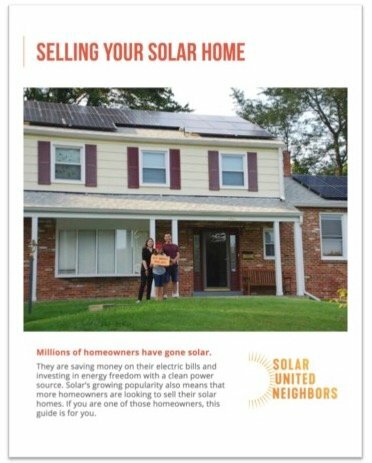 And, if you have a solar lease, it could complicate your sale. Our guide makes selling your solar home a smooth process. A typical solar system can add $15,000 or more to home resale value. * Prospective buyers will be interested in your low operating costs. Make sure you can maximize your return on your solar system. * Results vary based on size and age of system. "I'm a Florida homeowner with solar panels. In Gainesville, the avg time on market is two months and our house sold in about a week. Yay solar!"